The problem of arrangement of small and extra small bathrooms is familiar to many families. The standard and small one bedroom apartments, built over forty years ago, often allocated no more than 3.5 square meters under utilitarian space for have water and sanitation procedures. To equip such a small room with all necessary plumbing, storage systems and accessories is not easy task. Maintenance of the interior and exterior aesthetic appeal, not forgetting ergonomics plan, is probably even harder to provide. But the designers had a lot of time to invent the best ways for placing plumbing, the development of compact models of baths and showers, suspended sinks and toilets. We have gathered the most trendy of them in our nice collection of small bathroom interior space optimization ideas & layout photos 2017. Both as finishing materials manufacturers expand their segment of ceramic tiles product lines year by year. Their color and texture solutions are ideal for the design of small spaces. Nowadays, design of the bathroom with a small area, taking into account all the personal tastes and needs of the family, is not an impossible mission any more. 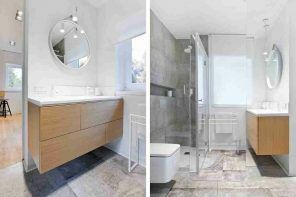 Moreover, for a host of modern small-sized bathroom designers offer a range of solutions to optimize the space, visual increasing of the room and creating truly practical, comfortable and beautiful design. We hope that we have collected a selection of small sized bathrooms design projects will help you in creating unique, practical and attractive interior of the multi-functional space with a special microclimate. Are you principal about the presence of the bathtub in the room or replacing it will not infringe on the needs and desires of households? Because the angular compact hydroboxing can significantly save valuable space of the bathroom. The smaller the space, the more carefully it is necessary to think through the design. Given that the count goes to centimeters, design of the modest sized bathroom should be considered to the last detail. Experts recommend using of total selection system specially for small spaces. All the elements, including the smallest accessories, are thought out at the planning stage. Such an approach will help not only to create the most efficient and comfortable design of utilitarian space, but also to protect themselves from unnecessary expenditures. These three components need to be properly dispose of that small room seemed not only more spacious, but could really contain all the necessary elements: plumbing with communications, storage, additional accessories, which are indispensable for the implementation of sanitary and hygienic procedures. number of plumbing (WC bath requires location of tub or shower, toilet and sink). When creating design projects of bathrooms, experts are trying to have a sink with a mirror above it in such fashion that they should appear as the first things that you see, coming into the room. But in the reality of small room we can step aside of this rule and move the sink closer to bathtub and toilet can be placed as close as possible to the sewage system. Internet contains a considerable number of programs that can assist you in composing layout of the premises on specific dimensions of the room and sanitary ware location. Modern sanitary ware manufacturers have no strict concepts of the standard dimension. You can find the correct size for a bath, shower, sink or toilet. The same applies to the design – a spectrum of performance variations is incredibly broad – from classical forms to elaborate ones. The minimum set of plumbing will allow you to create the most functional and comfortable design of the space. The toilet, sink and bathtub is a standard set of sanitary ware, which can accept an effective replacement. When taking a bath is not the principal hygienic procedure for your family, the replacement it with shower will optimally distribute the usable space of a small room, because the size range of angular device starts with the parameters of just 70 cm. This replacement will be more than needed if you plan of placing a washing machine within your small bathroom. If a bathtub replacement with shower is not your option, then, at least, it is necessary to use this massive plumbing object to the maximum extend. Combination of a bath with shower is effective method that allows to organize the maximum amount of water procedures at minimal cost. Transparent glass wall will not allow water to penetrate beyond the water treatment area without weighing the image of the interior at the same time. Choosing a bath for a small space must be based on the width (about the smallest wall) to plumbing could fit into the available space. Unfortunately, in this case, neither the growth of family members, nor personal preference do not count in the arrangement of space for water treatments. We have to sacrifice comfort for the sake of rational planning in small areas. And bathtub, which is built in niche (for the width of the room) is optimal use of available square meters to accommodate such a large-scale sanitary ware. The use of suspended structures helps in saving precious centimeters in small bathroom. Suspended toilets and sinks are not only ergonomically positioned in the room, but also bring practicality and comfort to the modern design of the bathroom of the room. Besides, it is much easier to carry out cleaning of the premises with such fixtures, which is mega important in a small area. Massive storage systems not only take up much space in a small space, but also visually heavier image of the space. The effective replacement for cabinets and pedestals may be open shelves, where you can put all the amenities. But in the pursuit of providing ourselves with the necessary number of surfaces for storing, it is important to stop in time. Clearly define the required number of shelves. The abundance of such structures can lead to the opposite effect. Small room can look overloaded with details and stuffed with trifles. As always, the truth is somewhere in the middle – between how much you need for storage and how many can afford in a small bathroom. All owners of small apartments or condos with small utilitarian spaces are well aware that light colors are preferred for finishing of their premises, as they contribute to visual increase of the space. But when we came to the store building materials and see the bright ceramic tile with a colorful pattern, we make a decision about purchasing this product from the colorful collection in spite of all the advice of designers. Light colors reflect light perfectly, spreading it over a small room and creating a visual extension. From a psychological point of view, all shades of white will help creating a soothing environment in which everyone will be comfortable. It is so important to be able to relax, retire and take a bath in the room, where nothing will irritate your eyes after the day’s work. But this does not mean that absolutely white bathroom is the best among design options. Rule of colors selection to increase the space says that ceiling should be the lightest spot. The walls should be painted slightly darker (or brighter) and the floor should be the darkest part. 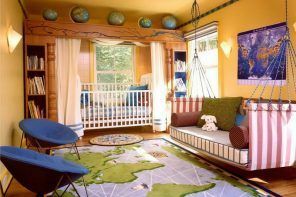 This color situation will help not only visually increase the height of the room, but also to create a favorable, in terms of emotional perception, background. 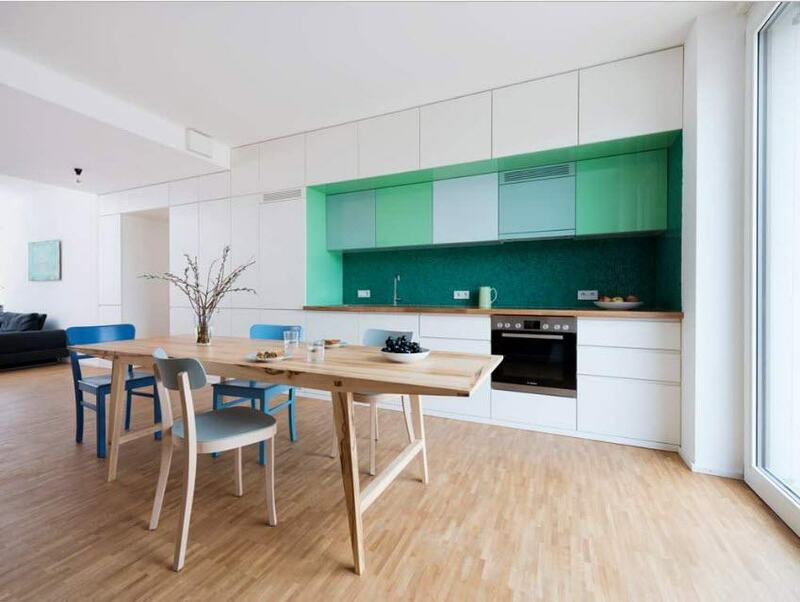 Colorful bezel, located on a light background will also visually increase the height of the room. Place a border or a mosaic insert not in the middle of the room, but a few centimeters higher, and the visual effect will surprise you. Bright interior accents are required. Experts recommend to dilute the white surface of a bathroom with natural wooden pattern. Whether it will be a light wood such as pine or maple, or contrast solution based on shades of wenge, it is important thing that such a design will not appear dull, sterile and repulsive snow-white, uncomfortable. The easiest way to use wood (or its nice looking analogues) as a material storage: cabinets under the sink, open shelves or a small wall cabinet. The easiest way to create colorful accent in a bright room is with the help of textiles. Bathroom is no exception. 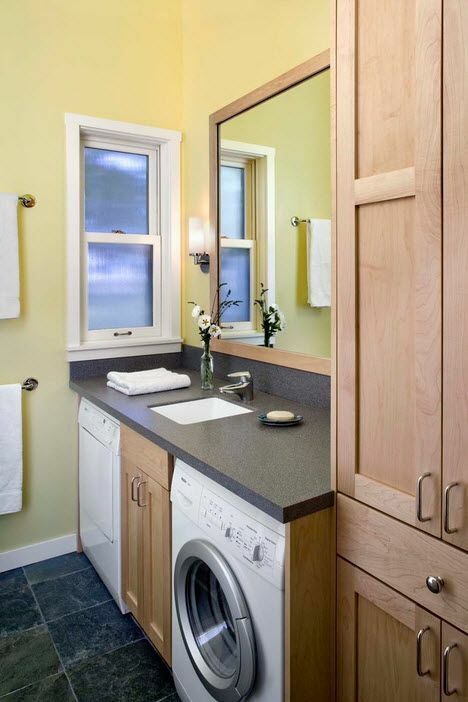 And though the curtains on the windows and even the mat near the tub or sink are options of giving brightness, which are available not for every utilitarian space, you can always use towels. Creating a bright accent with the finish is possible be with the help of conditional zoning of the area. For example, all the surfaces could be painted in a light tone, and backsplash over a sink or shower area would be logical to decorate with colorful mosaic tiles. But in this case, it is important not to overdo it with accents, to avoid emotionally depressing image of the space, which is supposed to complete the atmosphere of relaxation. The shape and size of the finishing slabs are equally important. Experts recommend to choose medium-sized tiles for small spaces. Oversize items would be misplaced, and too small (especially the square tiles) would visually reduce the volume of the room. The vertical arrangement of rectangular tiles will create a visual increase in the height of the ceiling in the bathroom. A diagonal arrangement of the elements will increase the visual area of ​​each of the surfaces. Floor tiles laid diagonally are especially recommended. It will require little more material than the standard layout, but the effect of this design is worth the cost. Glossy design of vertical surfaces in small rooms is more prioritized than matted. If you are not ready to create a color emphasis, just dilute the light room with texture. The small convexity on one wall of the bathroom will not disturb the harmony, but will help to diversify the design, to bring originality into the light interior. Mosaic tile is great for zoning the space using finishes. Use mosaic as a decorative material for shower area or over the bath, sink backsplash. Such an approach will not only provide reliable protection of the walls from moisture and temperature changes, but will also diversify the image of a bathroom, will bring an element of originality. Create the required level of illumination in a room of modest size is not just mandatory point in the task list of designing but foreground work. Lighting plays a special role in a small room. That is why you can’t limit yourself only to the central lamp or built-in lighting around the perimeter of the room’s ceiling. Wall lights near the mirror or LED lights will help to create an additional light accent and visually expand the zone. The use of mirrors for visual expansion of space’s volume is the old design method, which is actively used in the rooms with most diverse range of functional loads. Such a way to “erase” the boundaries of space for the bathroom fits perfectly, because no bathroom is complete without a mirror. You will not recognize your little room, if use mirror surface over the entire space of the sink backsplash instead of the usual medium-sized mirror. It will not be difficult to build wall lights or faucets in such a mirror these days. Mirror surface can accommodate shelves or a small embedded LED strip. The possibilities are limited only by your imagination, needs and budget. Hanging lockers with mirrored doors located above the sink will help you not only place the necessary stuff in storage, but also to increase the space visually. Such cabinets are often made shallow, but this space is sufficient to accommodate the medicine chest, cosmetics, and even a hair dryer on the shelves. Mirrored facade mounted storage systems can be either smooth or provided with fittings. What to do if your utilitarian room can’t not only boast of a large area, but also located in the complex in terms of the geometry architectural space of the attic? Of course, do not despair. 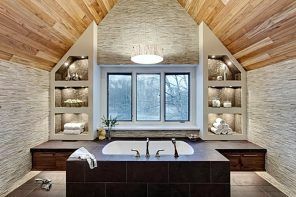 There are many examples of design projects of bathrooms with efficient design, even in areas with a large number of projections and the abrupt slant of the ceiling. When you create interior space design of the utilitarian space, located in the attic or loft apply all the same rules for increasing the visual space, as in conventional bathrooms. With only one amendment – taking into account the architectural features. Locate storage systems in places with most sharp ceiling bevel. And place the shower area within the highest point segment. It is impossible to avoid transferring of plumbing, if initially there was no decision on the location of the bathroom under the roof of a private home during planning and construction.